That previous post was only the first half of the day. The path to Susanne’s dock just has water for the upper part of the tide, so as things started to get shallower it was time to go. With a couple of tacks to get around the corner, and the current of the outgoing tide, it was another sweet little sail through the marsh. The fall colors, with the salt grass going from green to golden and brown, are a real treat. There are quite a few egrets in this area too, which is fun when they stand in the grass with just their head and neck showing, brilliant white in the fall colors. Once back to the deeper water I started thinking about going over to the edge where there would be a sandbar as the tide went out further. Theoretically this was going to be a rest day, but sometimes those ideas go by the wayside. In the end it was a clean the bottom of the boat day. Which was fun, though a little strenuous. And then there were all the people who thought that the boat was over on its side because I was too goofy to manage to keep it in the channel! The funny thing about this area is that not a single person – of all the many who went by – stopped to chat, let alone to ask if everything was okay. And I was, of course, fine. But it did surprise me, and was out of the ordinary, in the general scheme of boat things. Maybe they see this all the time, on the bars in here? Or are a little fried, this being the end of the summer season. Anyway, it did make me glad that I was not in fact having a problem. The report on the underside of the boat and the ePaint is that, like last year, slime was getting going on all the newly painted surfaces. This is expected, and it comes off reasonably easily with a small brush. The real test was where the trailer bunk boards were. Those spots only had the old paint still left after last year, which was pretty worn and showing the gray marker coat underneath the white. Those areas could have used fresh paint – and the barnacles are there to make the point. I have a plastic putty knife/scraper on board for hull cleaning, and the good news is that it takes the barnacles right off. But it’s a big job, and I did not quite get the entire port side cleaned. The most useful part of the exercise was getting to see what’s been going on down there on the underside of the boat. Now I’m thinking that if I can get some help – for example somebody who does diving/boat cleaning – that the right thing to do is to get the hull cleaned before we pull the boat out of the water in a week and a half. For one thing, the barnacles are located exactly where the bunk boards go. There will be no cleaning them easily once the boat is on the trailer! Plan B, if the diver idea doesn’t work out, is to consider having the boat hauled on a lift and power washed. 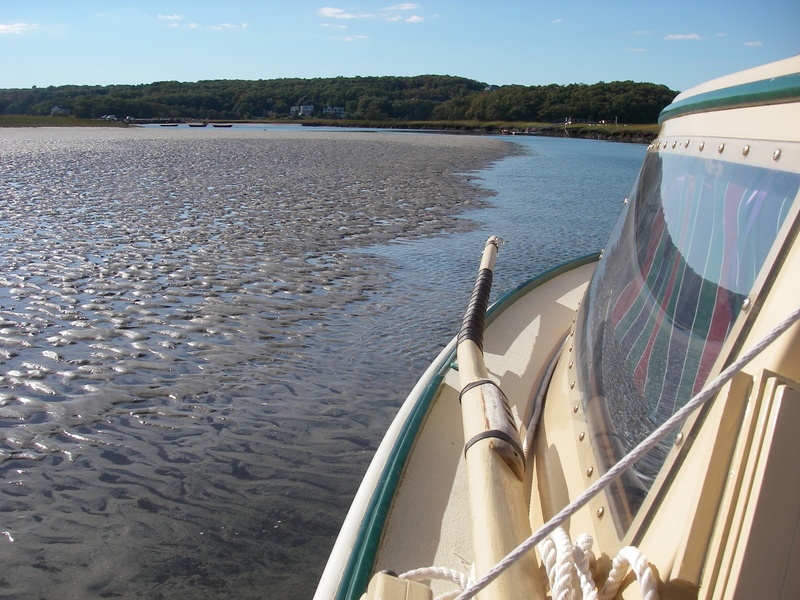 And plan C is that I put the boat on a sandbar again on one of these nice days. If nothing else, there are plenty of options!